Above: One of my panzanella salads. This one has cucumber and white beans in there too. About this time of year, gardeners (and their lucky friends) are becoming awash in lovely ripe tomatoes. And once you’ve made multiple salsas and pasta sauces, and your freezer is full, well, it’s time to put a little panzanella into your life. Panzanella is best described as a tomato-bread salad, originating in Italy. (I’ve also seen it called Tuscan bread salad.) “Bread salad” may sound a little strange, but I can assure you that it’s delicious — and a cooling change of pace, especially in hot weather. To make panzanella, you need good, sturdy bread, preferably a bit stale. Italian or French or country white bread are all good choices. You can probably find a suitable loaf on the day-old rack at your local bakery or grocery store. If not, you can slice or tear a fresh loaf into chunks or cubes, leave it out for a few hours to stale a bit, and then use it. (I’ve even toasted my bread chunks to get them dry in a hurry.) If the bread is a bit dry, it won’t get overly soggy as it soaks up the tomato juices. Cut the tomatoes into chunks and pour them and all their juices over the bread. Add the olive oil and vinegar (or use a bottled Italian dressing), the onions and the basil — about a half-dozen shredded leaves if you have fresh, a half-teaspoon of dried if you don’t — mix it all up, and add salt and fresh-ground pepper to taste. You can let your panzanella sit at room temperature if you’ll be eating it within an hour or so; otherwise, refrigerate it until serving, especially if you’ve added meat and cheese to it. What I like about panzanella is that it takes so well to leftovers and improvisation. Don’t have red onion? Use white ones, or sliced green onions. Can’t live without chopped celery? Go ahead and add it. How about those leftover beans from the other night? Sure, toss them in, along with some black or green olives. If you prefer the taste of fresh thyme or parsley to basil, go for it. — More vegetables, like radishes, artichoke hearts, bell peppers, garbanzo beans, green beans, shredded carrots, fresh peas, cooked edamame. 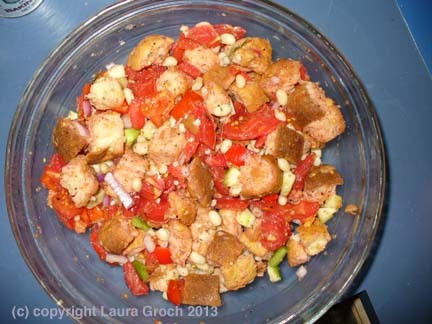 When you’re ready to serve the panzanella, the bread chunks should be nicely chewy and moist. If they seem dry, add a tomato, or more dressing. This just in (to my brain, that is): I bet you could create a Mexican-flavored panzanella by using cilantro instead of basil, a chopped jalapeno pepper, black beans instead of white, and about a half-cup of canned (or fresh) corn. Add cubed Monterey jack cheese or your favorite Mexican cheese, and sprinkle with a few crushed tortilla chips. Or even Greek-style: Lemon juice instead of vinegar, plus black olives and chunked peeled cucumber; canned tuna instead of ham or salami; feta cheese; and flavor with oregano instead of basil. That’s the beauty of panzanella. There’s no one way to make it, and it can be different every time, depending on how you feel and what’s in the fridge. What a perfect summertime dish! Enjoy! P.S. Got variations? Share them in the comments, please! Tuesday is farmers market day in Escondido, and there’s almost always a new discovery each week. I was pleased recently to encounter a former co-worker from the North County Times, Kate Carpenter, staffing a booth for her business, Sunnyside Kitchen. Kate offers bite-size cookies, muffins and cakes, and has recently added panini, grilled to order by her husband, Bob. Varieties include Gourmet Grilled Cheese, BBQ Chicken Grilled Cheese, and Vegetarian Mediterranean; prices are $5 to $9. The bite-sized cookies (such as Chocolate Delights, with white chocolate chips and pecans) are $2 for a half-dozen. 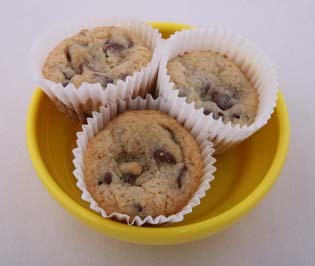 Gluten-free cookies (like the chocolate chip cookie cups, pictured) are twice as big, so those are 3 for $2. (And she’s got Buckeyes for order through the website!) 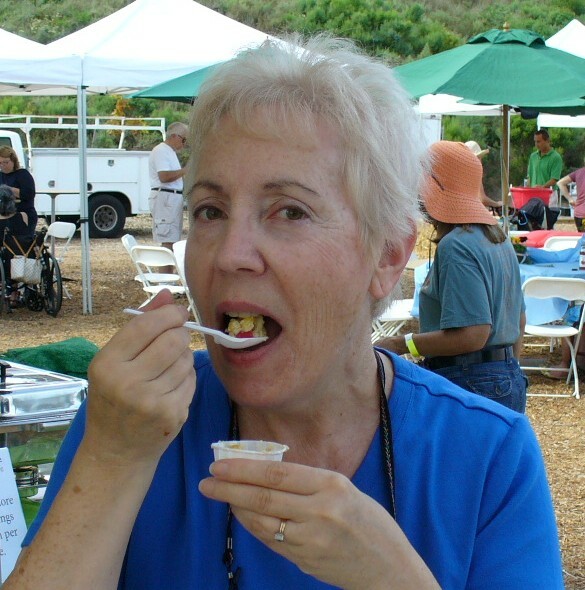 If you can’t make it to the Tuesday market, try Sundays at the North San Diego Farmers Market at Sikes Adobe across from Westfield North County mall in Escondido. Kate’s cookies are also available at Rock n’ Jenny’s Italian Subs; Diego’s Place; Major Market Escondido; Kettle Coffee & Tea; and Orfila Winery. Visit sunnysidekitchen.com or email sunnysidekitchen@gmail.com! 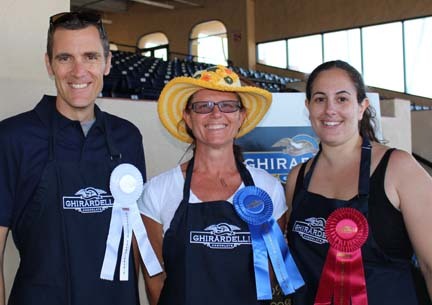 End of the fair, but recipes keep coming! Preheat oven to 350 degrees. Line 9-inch pie pan with 1 Pillsbury pie crust. Combine butter, onion and garlic in large skillet; cook until ingredients are soft. Add mushrooms and cook 5 minutes more. Add bacon, chicken, parsley, cream of chicken soup and chicken broth. Stir until thoroughly combined. Add salt and pepper to taste. Fill lined pie pan with chicken and mushroom mixture. Top with remaining pie crust; brush top with egg and water mixture. Bake pie at 350 degrees for 30 to 45 minutes, or until crust is golden brown. Combine peanut butter, butter, coconut, powdered sugar and vanilla in a bowl. Mix well. Take two pretzels and put a tablespoon of the mixture in between, creating a sandwich. Melt Ghirardelli bittersweet chocolate on the stove over low heat, stirring constantly. Dip bottom of the sandwich in melted chocolate. Refrigerate for 1 hour. Yields: 24 Chetzels. Line 2 cookie sheets with parchment paper. Preheat oven to 450 degrees. In large bowl, combine Bisquick mix and Mexican seasoning; mix well with wooden spoon. Add cheddar cheese and chorizo; mix well. In small bowl, combine creamed corn and milk. Fold corn mixture into Bisquick mixture, blending well. Using a well-rounded spoonful for each, form 16 nuggets out of the Bisquick mixture and place on the prepared cookie sheet, 4 nuggets to a row. Press an olive in the center of each nugget and press all the way down so dough fully covers the olive. Bake 12 to 13 minutes until golden brown. Remove to cooling rack. Prepare remaining nuggets for baking while first set bakes. For Creamy Salsa, combine cream cheese and sour cream in medium bowl. Beat well with electric mixer until smooth. Add Mexican seasoning and blend. Beat in salsa until blended. Cover and chill. Salsa is best made overnight or early in the day. Serve nuggets with warm salsa dip. Yields: 32 nuggets. Heat oven to 350 degrees. Lightly grease small jelly-roll pan. Whisk Bisquick mix and rosemary together. Set aside. Mix Madeira and evaporated milk. Stir into dry ingredients until soft dough forms. Knead 10 times. Halve the dough into 2 balls. Roll each into 8-inch circle. Set brie in center of one circle. Cover brie with other circle and form dough over brie. Dampen edges of bottom circle of dough and seal it to the top dough. Brush with olive oil and invert onto jelly-roll pan. Brush other side with olive oil. Bake for 30 minutes or until golden brown. Cool for 90 minutes. Serve with apricot preserves.